As well as running my own business, in my spare time I’m an open water swimmer and a member of the British Long Distance Swimming Association (BLDSA). While I’m not necessarily any good, I am keen (and I’m talking about the swimming, although many may think that applies to business as well). As the distances and times I’m swimming have increased, I’ve become more and more aware of the similarities between the two aspects of my life. In particular I’ve realised that the lessons I’m learning from the swimming can be applied to business. This is a quote which is attributed to Captain Matthew Webb who was the first person to ever swim the English Channel. His was such a feat that the next person to swim it didn’t complete their crossing until 36 years after Captain Webb and more people have climbed Everest than have ever swum the channel. So he knew about ‘great’ and he knew about things not being easy (his crossing took him 21 hours). The link to business is quite clear though. If you want to do great work, or build a great business, it won’t be easy. Accept that fact, be prepared for ‘hard’ and then get on with it – just like Captain Webb did. This is literally true in open water swimming. 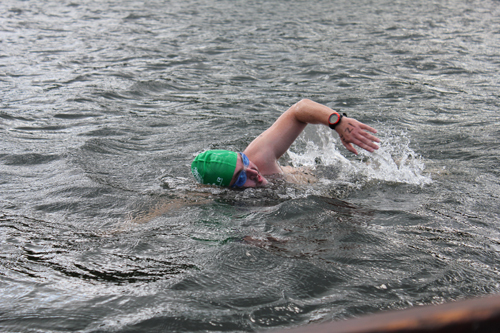 I regularly get in lakes that are 15OC or below – and I swim without a wetsuit. And although I often swim in events or with a support boat it’s pretty hard to chat while you’re swimming. In business this is figurative, but it can often feel both cold and lonely – especially as you start out on your own. For both of them you can overcome these feelings. While I’m swimming the cold water makes me realise that I’m doing something tough that many others couldn’t do and I take pride in that. Whereas the loneliness gives me the chance to think about my stroke, to focus my energies, or even plan the occasional blog post. One of the best ways to overcome the loneliness is to find the community of others that share your passion and your pain. In swimming terms there is a great group of people that are only too willing to offer a pat on the back, a kick up the backside, a warm cup of tea or a piece of cake. Support is also readily available across the business world at conferences, networking events or even within your peers. There is always more support than you realise as long as you seek it out and are willing to reciprocate. It’s amazing what a metaphorical (or literal) piece of cake can do for your morale. Swimming goals are often easy – I want to swim all the way to the other end of the lake. If I’m feeling brave I will add a time goal as well. But I can usually see exactly where I’m headed and that helps massively. In business you need to see where you are going, you need to have a target and also a plan about how you will get there. Setting goals is actually only half of the battle, you also have to plan how you will hit those goals. 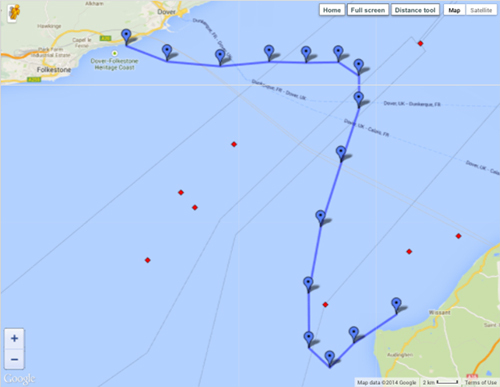 When I was part of a recent channel relay team our goal was clear – swim to France. However we had to contend with the tides, the currents, the weather and the other boat traffic. Things you can’t always plan for will appear and try to knock you off course. Be prepared for that. Be prepared to reset your path, to revise your plans, to alter your course. But still strive to reach your goals. During the swimming season I’m regularly in the lake I train in by 6:30am. I like to swim for three hours and then go to work. I then have to find the time to fit in longer swims too. It takes some sacrifice, a willingness to get up early, a few nights out being cancelled. But when I complete my swims I know that it’s worth it. Your business will take sacrifices and hard work too. That is part of the deal that you’ve signed up to. If you stick to it and continue to work hard, the rewards will come. Despite the cold water, early mornings and long hours training I swim because I enjoy it. Your business needs to be enjoyable too. Sometimes you may need to remind yourself that it’s fun, that you’ve chosen to do this, but you always need to be able to find joy in it. The hard work and sacrifices become so much easier if you also allow and remind yourself to have fun. A wonderful way of explaining how to set up a business. I love swimming and I am creating/studying/learning and enjoying the current process of setting up a business. Thank you for sharing your wonderful words. Great blog – I’m a triathlete and although the distances I swim are a fairy step compared to your swims I see a lot of parallels too.